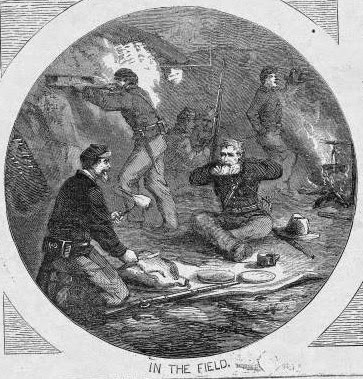 Civil War soldiers cooking and dining "in the field." "Whisking with all your might and main... is good exercise for young ladies" and, the author quipped, might be added to gym classes. The recipe below called for osier twig whisks, but there were other ways to whip up a froth, such as chocolate mills, syllabub mills, milking cows, or tin-tube churns. And then, for cat lovers, store the tray of syllabubs in "the coolest nook you have, that is free from dust, draughts, and intrusive cats." 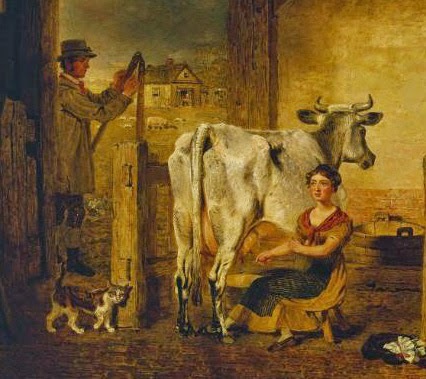 As late as 1878, a book by Doctor Delamere, Wholesome Fare, used milk straight from a cow, or as a substitute for a cow: one could use a large syringe or stand on a table. Start milking a calm cow, then near the end when the milk is richest, milk "the strippings" into the bowl. Pink and white syllabubs, just in time for Mother's Day. Mrs. Raffald, 1769 pours some extra wine in the glass and topped with sweetened cream flavored with brandy or Madeira whipped in a chocolate mill.